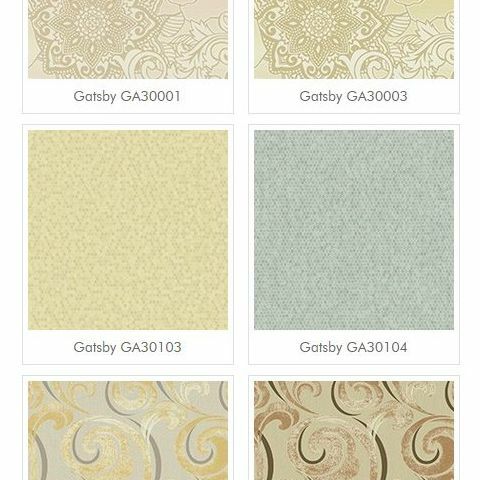 Inspired by the glamour, sophistication and architectural details of the Art Deco era, Gatsby offers ultra-sophisticated patterns that rely on the use of beautiful metallic inks that impart a modern-cool look to the patterns. Streamlined damask designs, bold ogee patterns, empire trellis' and undulating scrolls possess strong character and an unwavering sense of style. The daring colour palette of black, white and gold runs throughout the collection but quieter offerings of pale silvers, tonal whites and earthy neutral mixes are also offered for a versatile mix of colour and pattern.